Why do we talk about surfing here? The world we live and work in has become more and more fluid over the past years. Leaders all over the world are experiencing the challenges that come with volatility, uncertainty and complexity. Changes are happening so fast that it’s hard to build ideas, concepts and businesses on solid and stable ground. Instead, it seems reasonable to embrace the change and to start working with what you got, symbolized by waves unpredictably rolling in from the horizon. 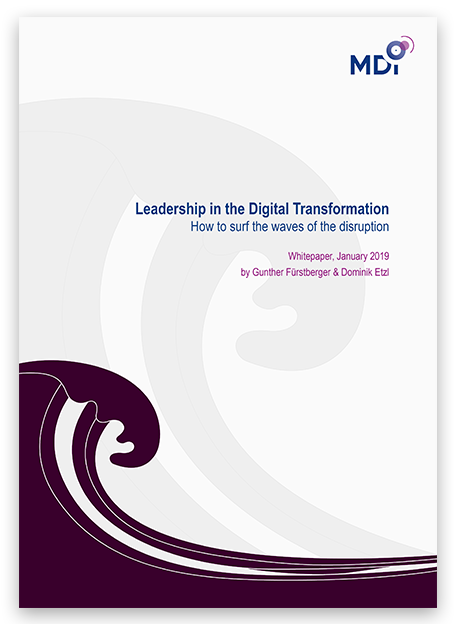 How to surf the waves of the Digital Transformation? In order to be able to surf these waves of the digitalization and with them the challenges and changes you have to face on a daily basis, you need to adapt your own leadership approach and dive deep into mindset, skillset and toolset of really agile leaders. In our free whitepaper we’ll provide you with information, inspiration and practical tips. So you can sustainably shape the future of your business. Get to know the most effective tools and concepts for innovation, productivity and growth to surge the challenges and changes of the digitalization with our Agile Leadership Certification. Dive right into the the principles of Agile Leadership to succeed in this fast developing digital world and learn how to surf the waves of disruption with our Agile Leadership 101 video series. Moreover, step directly on the path of success in the digitalization and become a certified agile leader.